How Long Can the Gaboon Viper Snake Live? The tropical Gaboon viper snakes (Bitis gabonica), or Gaboon adders, are common in central Africa and may be found wherever there’s plenty of leaf litter to hide in. Gaboons have lived as long as 18 years in captivity. While it’s unknown what the wild specimen’s life span may be, these animals are subjected to numerous life-threatening factors that their captive counterparts never encounter. The Gaboon is a beauty -- if not the most stunning African serpent, then definitely the most gorgeous African viper. Pearly tans, browns, pinks and purples create a complex, symmetrical pattern that allows the animal to blend nearly flawlessly into rain forest floor leaf litter. Even the Gaboon’s head is rather leaf-shaped, lending credence to the charade. Diseases are surely responsible for reduced life expectancy in wild snakes, who die from lethal infections. Fatal adenoviral diseases have been found in wild-caught Gaboons. Other lethal infections include retroviruses and paramyxovirus respiratory illness, as well as numerous bacterial infections such as septicemia, abscesses, infectious stomatitis (mouth rot), pneumonia and salmonella. Blood-sucking mites and ticks infest all wild snakes to some degree. Endoparasites are also common, including tapeworms, lung nematodes, stomach worms, ascarids and protozoal pathogens. 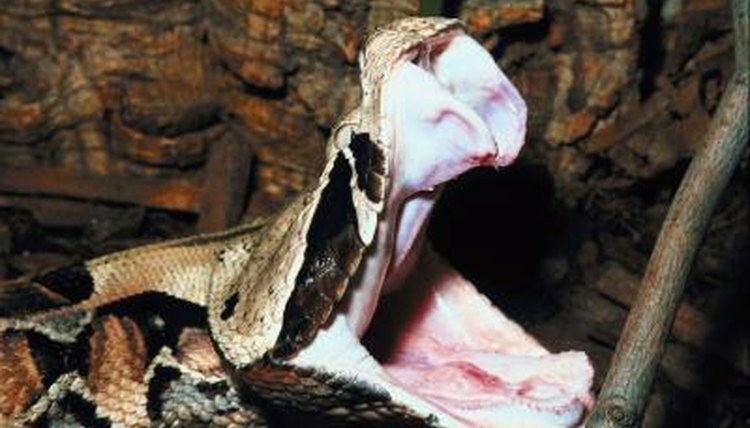 While the Gaboon has no known predators, snakes are often attacked by their prey. Rodent bites commonly lead to death. Large Gaboons go for big meals, such as brush-tailed porcupine (Atherurus africanus) and royal antelope (Neotragus pygmaeus), both of which can inflict debilitating injury. Where Do the Most Deadly Snakes Reside? What's the Most Venomous Snake in the Sahara Desert?